I hope I’ve previously made it clear how important I think work experience is – I’ve mentioned it several times, and written at least one specific post on it. Someone emails me requesting work experience – either cold, or after coming up and talking to me after a talk I’ve given. I reply fairly promptly, but tell them that I’ll keep their details on file, as 9 times out of 10 I’ve got nothing on immediately that would suit them. Because of this I ask people to stay in touch. It’s at this point that most people fall by the wayside, as they seem to think that 1 email will be enough for me to remember them by forever after. Several weeks later, and with a suitable shoot just a few days away, someone else emails, and I offer them a place. I haven’t heard from the original person since their first contact, and their email is languishing in my “assistants” folder. Am I making myself clear yet? There’s lots of you lot, and only 1 of me – if you want something from someone busy like myself, you’ll have to make a bit more effort than 1 email! Enough ranting, on with the main part of this post, which for once is not written by me. Rob Rusling came down for work experience just before Christmas (last shoot I did in 2008, in fact), and since the stuff’s just been published in Men’s Fitness, I can go ahead and publish the account I asked him to write. Over to you Rob. Rob (Centre) looking thoughtful on work experience. Taken by Donovan the Art Director. I took it upon myself to contact Tom as soon as I got back from the lecture that he gave at Blackpool and the Fylde College, which is where I currently study on the BA Hons photography course. I’m in the second year, so contacting photographers for work experience is something that we have been working on over the past few months so I already had an idea of what I needed to put in the email, it’s structure, it’s purpose and it’s formality. Tom emailed back straight away and said he would put me on the list for work experience but it was very long so keep in touch, which I did, the odd email here and there and Tom eventually contacted me regarding a shoot in London that he thought would be a good work experience opportunity. I think an important thing to add is that it was around the Christmas break so travel to London was more difficult than it would normally be, and this could easily have put me off, but I think that it’s important to remember that these photographers don’t owe us work experience and if we let them down over travel then that is a huge opportunity that we no doubt will not get again, so even if there are issues I would suggest finding a way around them and remaining professional, which I hope I managed to do. When I arrived on the shoot I was met by the owner of the studios and let in to the studio space, the entire place was very professional very tidy and had just been painted, I presume this is to keep marks off of the images and not cause any silly retouch costs. Tom and his assistant Duncan arrived and we carried the equipment up to the studio and promptly began to unpack the lights, camera and laptop. Tom knew how he wanted the light set up, he’d been given the brief and a few things that the art director wanted in shot and so was able to establish what he wanted very quickly, he then told me and Duncan what was needed in terms of lighting and we got straight into setting the studio up ready for the shoot. This was the most hands on part of the day, and I was able to really get involved in the lighting, as me and Duncan set lights up Tom would be explaining things while setting up his camera and laptop as well as lending a hand in the light setup. I found it interesting to see how experience was used and he was able to really visualise how every light was affecting the set. We used a range of equipment on the day some I was familiar with and some that was new to me, Duncan and Tom made it very clear to me to be open about anything that was new to me, and when something was it was always explained by one of them, which made it really easy to understand what was going on. When the lights where set up and test shots had been taken The art Director and journalist from the magazine came on set, Tom and the people from the magazine were very open with me about the process of shooting and then going to press. The people from the magazine where shown the test shots, a few adjustments made, then the people to be photographed arrived and the shoot began. While Tom was shooting it was a very open collaboration between photographer and art director both would discuss the images that were appearing on screen, what needed changing, what they liked, and most importantly what would work with the magazine layout. We changed the lighting slightly for individual shots of the three men being photographed and again Tom and the art director decided what was needed and it was shot. 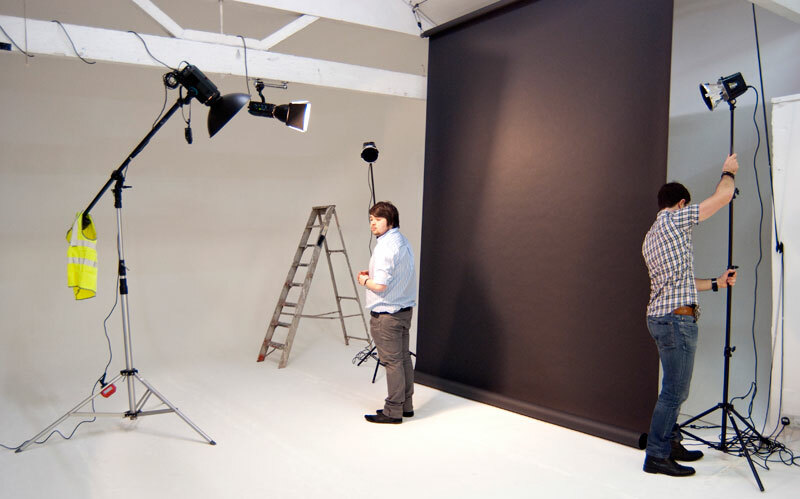 When the three men being photographed had left Tom and the Art director looked through the images and they were copied to disk and given to the art director instantly. The art director told me that this was key to Tom’s success, the industry is very fast paced and this style of working that Tom employs allows for deadlines to be met by the magazine. There is little or no work needed on post production as the lighting was made correct before we shot, this was important as the magazine only works on the next months magazine so deadlines are tight. I was told a lot by the art director of the magazine about the industry, about the importance of a commercial mindset, and how in this sector of the industry it is important to realise the pace of work that is needed and the standards it must meet. He also told me about how important it is to push early to get into magazines even if its thumbs because tear sheets are really important in portfolios. The info that I got from the people from the magazine was second to none and allowed me to gather an insight into the industry that I have never seen. The work experience that I had with Tom was superb, I learnt a few little technical bits to do with the lights and cameras, but most importantly I learned about how people in the industry work, about how things get done on a day to day basis. I could learn how to do lighting from a book and from being in a studio on my own but the information I got from Tom, Duncan and the art director of the magazine was some of the best I’ve ever had and was second to none, I can only hope I get this opportunity again. OK, so besides the fact that I’m clearly awesome (but, we knew this already) what did Rob learn from a day in the studio? The technical stuff I think he learnt was much less inclined towards the effects of lighting, and much more inclined towards what I call procedural stuff. By this I mean things like rigging lights safely, being aware of lots of people milling around the studio, and cutting corners wherever possible! Far more importantly than this, I know he picked up lots of stuff about the business. He mentions chatting to the Art Director, and I recall that they were talking for a good 15 minutes whilst I was working on the laptop, with the journalist from MF chipping in too. The sort of stuff they were talking about is the kind of thing that never gets covered at college – at least not at any course I’ve ever seen. And that, my friends, is the essence of work experience!